This morning was cloudy and cool and never really warmed up until the sun came out in early afternoon. It then became quite warm and turned into a lovely evening. 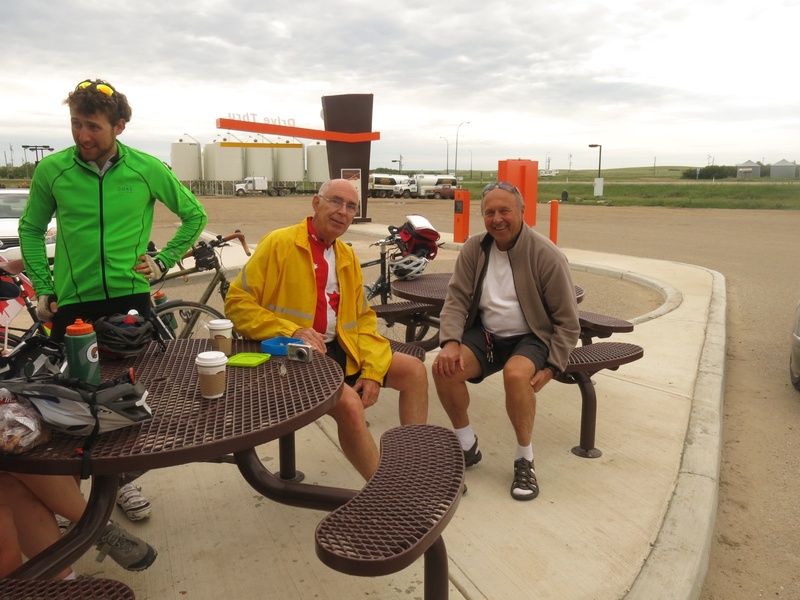 We had an early breakfast today as everyone wanted to get going early on our 145 km ride to Kindersley. As our crew was cooking dinner we had a little extra incentive to get going so we could arrive early and get dinner started. We were underway by about 7:15. In Cereal we stopped at an A&W along the highway where I had a hot chocolate to accompany my first PB sandwich of the day. While we were sitting there a fellow walked up and tapped Michel on the shoulder. John and Michel used to work together and he was on his way back from their farm to Calgary. He had figured out roughly where Michel might be and when he saw a bunch of bikes he stopped in. Michel was completely surprised. 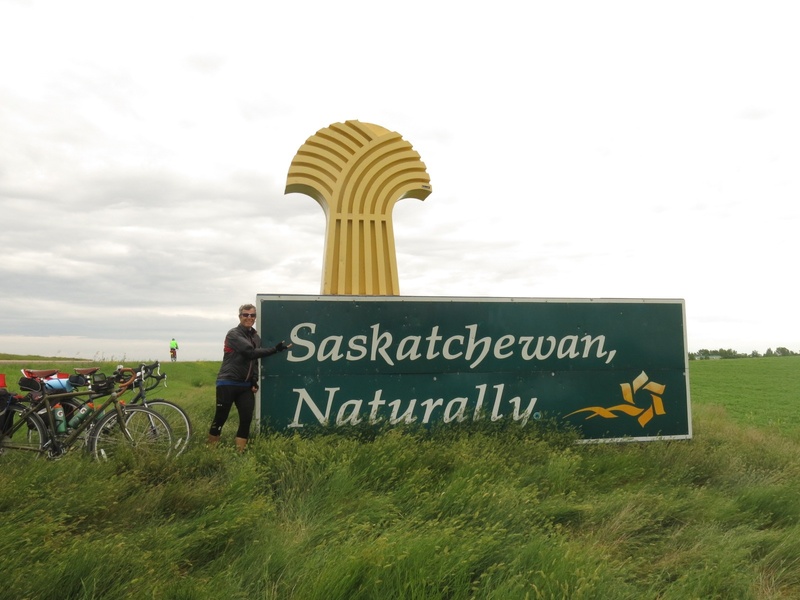 Of course the big milestone of the day came at 11:55 when we crossed into Saskatchewan. YES! can you believe it? Province number three! In some respects it doesn’t seem like that long ago that we left Vancouver but when I think about all we’ve seen and all the places we’ve stayed, Vancouver seems like a long way away. We rode for quite a while until we came to a little roadside store in Flaxcombe where I bought a drink to go with my second PB sandwich of the day. 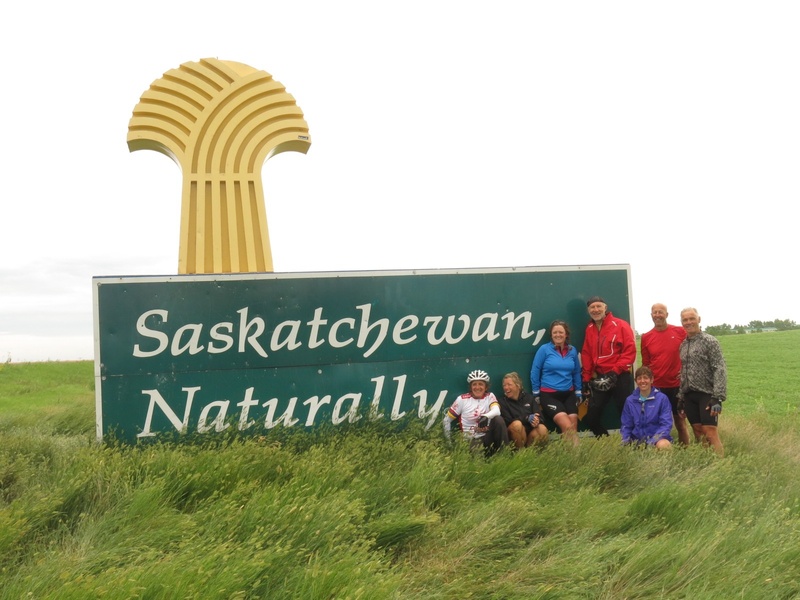 While there we met a young fellow who was riding across Canada unsupported. He had started in Seattle and ridden north to Vancouver a week or two before we started. Generally he was riding shorter distances than us each day. 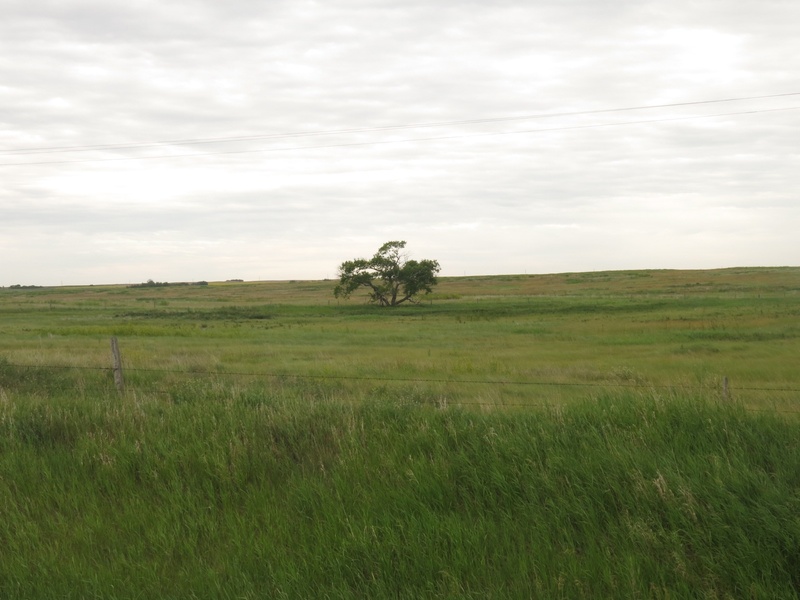 Just as a side note, anyone who says this part of Alberta/Saskatchewan is flat hasn’t ridden a bicycle through it. The area is quite rolly. We arrived in Kindersley by about 3:15 – just enough time to get my tent up and have a shower before we had to start dinner. Our total distance for the day was 152 km. We were having a veggie stir fry: pork for most of us and tofu for our vegetarian and anyone else who wanted it. Initially my job was to mince a couple of garlic bulbs (I like smashing the cloves with the side of a knife) then I cut up pork into small cubes. When it came time to cook I was the tofu fryer. Megan, who loves rice crispie squares, was recruited to make some of her specialty. All-in-all the dinner was quite delicious. After all the clean-up was done Rob, Mike and I wandered over to the golf course. As it was too late to golf we had to settle for a couple of beers before returning to our tents and calling it a night. Hi Neil, I just caught up on your blog. Great work! I can’t believe how you’ve been able to capture so many details (both in pictures and writing) even though you have a jam packed cycling, camping and cooking schedule. BTW, you’ll have to remind me how you are doing your blogs. Does your truck create a local hotspot that you connect with an iPad or netbook? Thanks Andrew. No the truck doesn’t create a hotspot. We have to rely on the campgrounds offering Wifi. I use the WordPress app on my iPad which allows me to write offline. I then use a browser when I have I Internet access to upload photos as that gives me greater flexibility than using the WordPress app for photos.